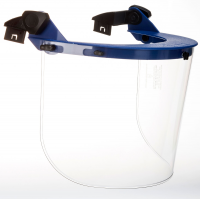 EN397 (industrial) has a weak chinstrap to prevent injury if the helmet becomes trapped in machinery etc. and small vents to prevent items such as sparks hitting the wearer. and large vents to help prevent workers getting too hot – an occupational health improvement. also conforms to MM 440 V a.c.
or 10 years anywhere in the world including Saudi Arabia). This was based on 40 hours per week average exposure. 30mm ‘T-slot’ side fittings for standard ear defenders etc. Clips for elastic strap mounted lights, cameras etc. Brackets front and rear for popular cap lamps and other accessories. Main adjustment to small/medium/large helps keep the helmet centred on the head. Fine adjustment by ratchet wheel, can be operated with one hand even whilst being worn.